Truly alleviating snoring and managing sleep apnea requires continued attention and care. Our oral appliances are FDA approved, non-invasive, adjustable, custom-fitted, and portable. They fit like a mouth guard or retainer. Oral appliances work by stabilizing your jaw and keeping the soft tissues and tongue from collapsing, thus opening your airway during sleep. 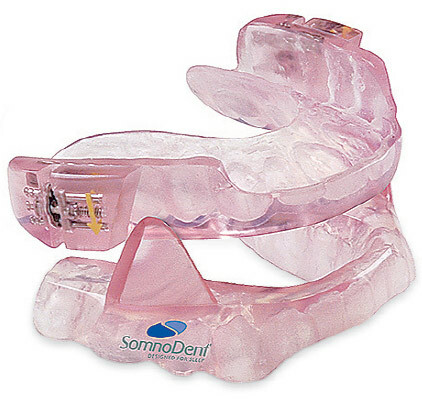 Sleep Apnea oral appliances have been in use for over fifteen years. Oral appliances have been shown to effectively treat mild to moderate sleep apnea and can be used for severe sleep apnea if the person is intolerant of CPAP. Whether it is your bed partner’s snoring that needs to be treated or your own sleep apnea, we are here to help. If you have not had a sleep study performed, or it was over 4 – 5 years ago, you will need to first meet with a sleep physician who will perform an examination and prescribe either a home sleep study or a diagnostic sleep study (PSG) to determine if your symptoms are present due to OSA. We are happy to provide referrals to our extensive network of sleep physicians. If you have already had a sleep study performed, within the past 4 – 5 years, and your sleep apnea is diagnosed as mild to moderate or if you are CPAP intolerant, an oral appliance may be just what you need to relieve your symptoms and help you sleep better. To fit you for your custom oral appliance, a simple impression of your bite will be taken in our office. The whole process is painless and quick. By the end of this visit your customized impression will be ready to start the fabrication of your unique appliance. We will explain how the appliance works and will answer any questions that you or your bed partner may have. Follow up visits to ensure your treatment is progressing and continuing to alleviate your symptoms will typically be needed for 3 months and are included in your treatment. Learn about our approach to treatment. Please call our office at (415) 233-4402 and find out more.